Have you got/ do you have knowledge of a one room flat/ studio in Bristol? A single Greek Orthodox lady is looking for one. Can you help? Please contact George on 07951 882654. So in a strange way in the Fast we draw away from the world in order to be closer to it; to withdraw from distractions so that we can see it – and ourselves as they really are. To this end the Church also gives us the weekday services with their special tone and mood. Our Fast cannot be fully understood until we enter the mind of the Church which is the mind of Christ. That is why we need to make the extra effort to share in these weekday services. Then, once we have “crossed the great sea of the Fast” we shall be ready to enter with Christ into his Passion, Death and Resurrection. The service of Vespers marks the tradition from one Liturgical day to the next, so on the Cheesefare Sunday evening we pass into the First Day of the Great Fast. After the Divine Liturgy we celebrate this Vespers. At the end of it the custom is for each of us to make a prostration and ask forgiveness for any wrong we have done one another. Then, owning our sins and mutually forgiven, we begin the journey together to Pascha. On each evening of the first four days of the Fast we celebrate Great Compline with a singing of part of the Great Canon of St Andrew of Crete. This wonderful penitential hymn sets the scene. It allows us to see how our sins, our choosing of self, sets a gulf between us and our God. It brings before us many examples from the Scriptures of sin and repentance and shows us that all that we each need to do is just that, turn back to God, own our sin and ask forgiveness and restoration of our relationship. This is our task for the Forty Days, to be cleansed of self and open again to God. On weekdays in the Fast we do not celebrate the Eucharist, The Divine Liturgy. But we still need the sustenance that the Communion in our Risen Lord provides. So, on Sundays the priest consecrates extra ‘Lambs’ (communion bread) and in the week, usually on Wednesday and Friday, we celebrate the evening service of Vespers, which then leads into Communion. It feels a bit like a Liturgy, hence its popular name, but really it isn’t. For one thing, the Divine Liturgy is always joyful, a celebration of the Resurrection. This service is penitential, the melodies are those of fasting days, there is no consecration of the Gifts. It reminds us, rather, that even in the midst of our sinful lives the presence of Christ in the Communion Bread and Wine is still there, the promise of New Life remains always open through the doors of repentance. Rather accord to your servant a spirit of chastity, humility, patience and love. for you are blessed to the ages of ages. Amen. Monday, March 11th. 6.30 p.m.	Great Compline with Great Canon of St Andrew of Crete Clean Monday. Beginning of the Great Fast. 6.30 p.m.	Great Compline with Great Canon of St Andrew of Crete Clean Tuesday. 6.30 p.m.	Great Compline with Great Canon of St Andrew of Crete Clean Wednesday. 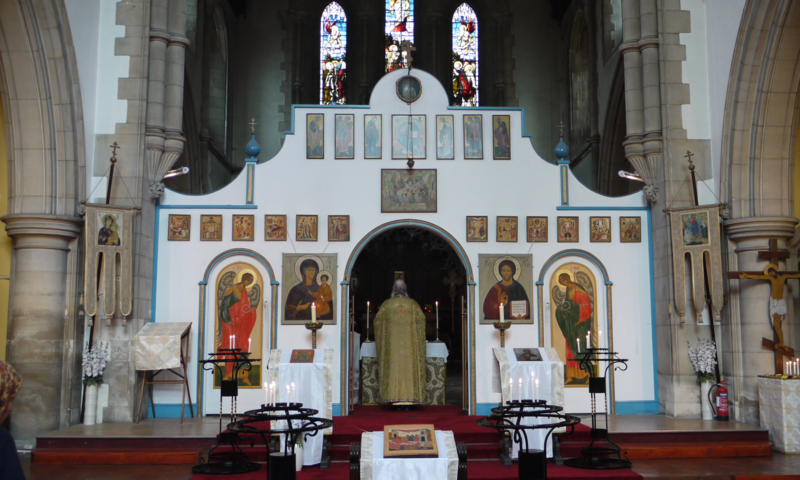 6.30 p.m.	Great Compline with Great Canon of St Andrew of Crete Clean Thursday. 10.30 a.m. Divine Liturgy Tone 1. First Sunday of the Great Fast. Sunday of the Triumph of Orthodoxy. Blessed are You, O Lord, highly exalted, glorified and good. In Your divine providence You set the length of the year, and have anchored us in these days of inner peace. To Your servants give the good fruit of righteousness in all their works. Give them might and power for the destruction of sin, and for the renewal of soul and mind, that during the forty days of the Fast, we might overcome the crafty contrivances of the Intruder, for You are our God. Through prayer and fasting You have made men equal to angels, and the fasting Moses You entrusted with the tablets of the Law written by Your divine hand. Now, O Lord, return us to the safe harbour of the honourable passion of Your Christ, that with the wood of the Cross as our weapon, we may be victors over sin and worthy of Your joyful Resurrection on the third day. Through the prayers and supplications of the most-holy and pure Theotokos and ever-virgin Mary and of all Your saints, now and ever and unto ages of ages. Friday: Apostle of the Seventy Aristoboulos. St Christodoulos of Patmos.